In a shocking incident, a man shot dead his younger brother at Bogdo colony of Aalo in West Siang district of Arunachal Pradesh on Saturday. The incident came to light only on Monday. 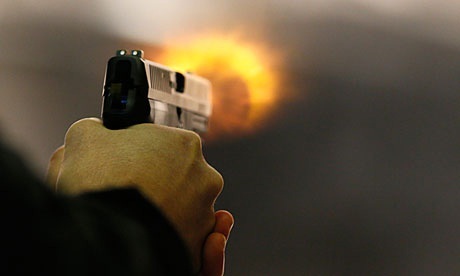 West Siang Superintendent of Police Jummar Basar informed that one Jarjum Lollen (29) shot dead his elder brother Jarli Lollen, in his late thirties at point-blank range after some altercation broke between the two at around 2.30 to 3 am in their private residence. Both the victim and the culprit are sons of former deputy commissioner Hujar Lollen. “A heated argument broke out between the two brothers for reason which has not been ascertained till now. The row turned out to be so ugly that Jarjum took out his father’s 22 caliber licensed revolver and shot at Jarli which left him dead on the spot,” informed SP Basar. Upon receipt of information the police immediately rushed to the spot and arrested Jarjum who is now under police custody. The victim’s body has been taken to the general hospital for a post-mortem, Basar added. One blank cartridge and the revolver used for the crime were retrieved from the spot and an FIR has been lodged against the culprit under the Arms Act and under section 302 for murder. The SP also informed that the designated investigating officer would further investigate the motive of the crime in detail and analyze all the statements of the witnesses. The victim is survived by his wife and minor daughter.